I have spent quite a bit of time flipping through my field guide to fungi over the last couple of years. Having only a very basic understanding of mushroom taxonomy, I generally check every single page in the guide until I find a good match, especially when it’s less clear to me which group a particular individual is likely to fall into. Anyone who has spent much time browsing field guides can likely relate when I say that after a while you start to pick out recognizable species that you haven’t yet seen but would really like to. That species (or in this case, group of species) for me in the fungi field guide was slime moulds. It even made #7 on my sixth top-ten list that I posted at the beginning of the year (list #6 was of non-bird observation targets). To say I was delighted, then, when I came across this sight on the forest floor at our Maplewood Bog site is an understatement. I was totally stoked, completely thrilled, stoked to my earlobes. And yes, over a fungus. But it wasn’t just any fungus, it was a slime mould! Number seven on my top-ten-to-see list! And I could even remember the exact photo depicting this species in my field guide, since it was probably the species of slime mould that intrigued me the most. I didn’t share my elation with Dan, though – he’s always very supportive, but I had a feeling the reaction I’d get would primarily be one of bemusement. Probably not that many people would get too excited over a slime mould. Call me a nerd. 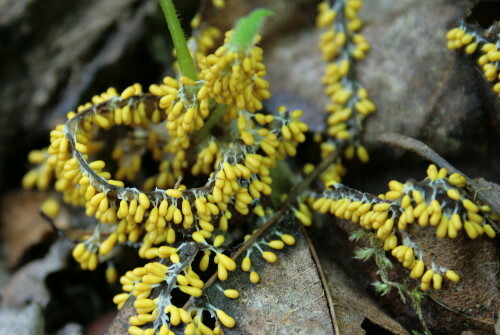 This species is Leocarpus fragilis, which goes by many common names including Eggshell Slime Mould, Insect-egg Slime Mould, and Fragile Yellow Slime Mould. The drop-shaped yellow things are the fruiting bodies of the slime mould, and the whitish stuff is the main “body”, the equivalent of the mycelium “root” network in a traditional mushroom. The difference is that the “roots” of slime moulds can get up and move. And I don’t just mean grow – I mean the whole entity can move from one location to another, climb up and over things, etc. Scientists have actually shown that slime moulds have the ability to “solve” mazes through a trial-and-error process of sending out feelers till they find the right destination, then retracting all the wrong ones and just moving down the correct one. Strictly speaking, slime moulds aren’t even fungi (though they were once classified there) – this and other unique characteristics have awarded them their own Phylum (the same taxonomic level as our classification as Chordata – the vertebrates), Mycetozoa. L. fragilis is typically found in woodland environments, where it fruits on a wide variety of substrates including, but not limited to, twigs, dead leaves, and overlapping vegetation (such as it’s doing here). Although it’s most commonly yellow, as here, it can also show up in shades of brown or orangeish. It seems to be a widespread species, found across North America as well as in England, from what I can tell from Google results; it might even be holarctic. 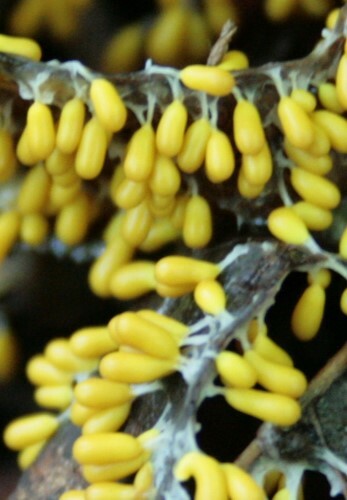 The common name of Insect-egg Slime Mould is easy to see the origin of, but the “Eggshell” and “Fragile” of the other two both refer to the fact that when the fruiting bodies are mature the outer shell of each little teardrop is quite brittle and will crack easily, releasing the black spores contained within. You’ve found a great slime mold. Many years ago, one of my botany professors gave me a start from his pet slime mold. His lived in a petri dish and lived on rolled oats, so I housed mine the same way. It lived for years, but perished when the dish was accidently crushed during a long distance move. Your post brought back fond memories of my pet. This is fabulous! I’ve never seen anything like it. Sadly, you’re right about most people’s lack of slime mold excitement. How dreary for them. 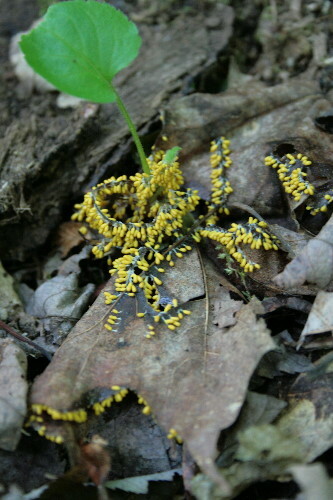 Just fascinating, I wouldn’t have realized it was a slime mold if I had seen it. –just recently discovered your site, and am enjoying it immensely! Wow. Mycetozoa: Mushroom beasts? Wouldn’t it be fabulous to see a time-lapse film of these things running around?